Dr. Akira Asari is a manager of an exploratory group at the Tokyo Research Institute of Seikagaku Corporation. He received his Master of Medical Sciences degree from the Graduate School of Medical Sciences, University of Tsukuba, in 1984. He started his study of glycosaminoglycans and proteoglycans as a staff member at Seikagaku Corporation in 1989 after engaging in studies on ultrastructures of mammalian cells at the Nomura Research Institute of Life Science. He received his doctrate from the University of Tsukuba in 1994. His dissertation was on the localization of hyaluronan in articular cartilage tissues. Dr. Asari has also studied the localization and kinetics of hyaluronan and CD44 in synovial and corneal tissues, and most recently, cell biological actions of hyaluronan, including signal transductions. Dr. Miyauchi is a manager in the Biological Science Section of the Tokyo Research Institute, Seikagaku Corporation. He received his Master of Agriculture degree from Niigata University in 1981, then joined Seikagaku Corporation. He was been engaged mainly in research on sodium hyaluronate used in ophthalmic surgery. He obtained his Ph.D. in 1987. Currently, he is supervising biological investigations on the medical applications of various glycosaminoglycans (GAGs). Hyaluronans high capacity for holding water and high viscoelasticity give it a unique profile among biological materials and make it suitable for various medical and pharmaceutical applications. We can find a variety of hyaluronan products in our daily life. For example, because it retains moisture, hyaluronan is used in some cosmetics to keep skin young and fresh-looking. Even though hyaluronan is abundant in skin, as we age, the water-holding ability of our skins hyaluronan is reduced by depolymerization. It follows that retention of abundant hyaluronan in skin may help keep us looking young. a See the review by Tammi and Tammi in this series. Many ideas for applying hyaluronan have been offered in areas other than cosmetics. The number of patents concerning hyaluronan is nearly 1,300 around the world. Only a few applications, however, are actually used in medicine. We show here medical applications of hyaluronan for the treatment of osteoarthritis and in medical devices used in ophthalmology, and then illustrate some mechanisms of the biological functions of hyaluronan. One of the most successful medical applications of hyaluronan is the use of sodium hyaluronate (NaHA) for the treatment of osteoarthritis, based on the concept of Balazs and Denlinger.1 A considerable number of osteoarthritis patients have benefited from this treatment since it was put into practice in Japan, Italy and Canada. The Seikagaku Corporation in Japan began to supply NaHA in 1987 and now supplies it in 10 countries. In 1998, approximately 2 million patients received NaHA in Japan, nearly 14 million packages. 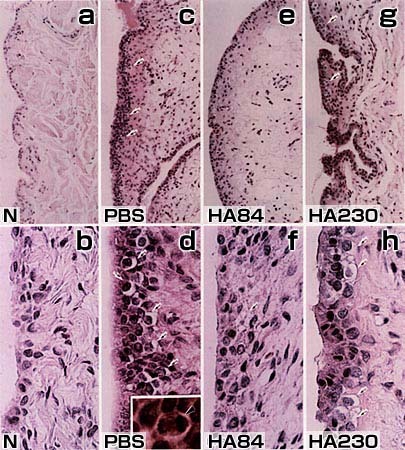 It has been reported that NaHA suppresses cartilage degeneration and release of proteoglycans from the extracellular matrix in cartilage tissues, protects the surface of articular cartilage,2,3 normalizes the properties of synovial fluids,4 and reduces pain perception.5,6 The mechanisms of these effects of NaHA on osteoarthritis, however, have not yet been fully elucidated. In addition, the average molecular size of NaHA varies depending on the manufacturers, a factor that has confused our understanding of the effects that the various forms may have (Table 1). Many unanswered questions still surround the use of NaHA for the treatment of osteoarthritis. Hyaluronan molecules are long unbranched chains of variable length consisting of disaccharides composed of N-acetylglucosamine and glucuronic acid. Honeycomb-like structures, which are formed by hydrophobic interactions, have been observed in hyaluronan molecules by electron microscopy.b This molecular structure may contribute to viscoelasticity. It has long been known that hyaluronan influences physical properties such as viscoelasticity and/or lubrication in stroma. Therefore, many researchers consider hyaluronan of higher molecular size to be more beneficial for osteoarthritis treatment, because the efficacy of NaHA to protect joint tissues as a shock absorber is dependent on its average molecular size. The molecular size of hyaluronan in the synovial fluid of healthy persons reportedly ranges between 2,000 x103 and 7,000 x10.3 7,8 Healon® (Pharmacia & Upjohn) and Synvisc® (Genzyme Biosurgery) fall within this molecular size range, while such other forms as Artz®(seikagaku) and Hyalgan® (Fidia) contain NaHA of smaller sizes. It has been shown that a higher average molecular size NaHA (2,000 x103) suppressed cartilage damage in a rabbit anterior cruciate ligament transection (ACLT) model for osteoarthritis better than did a lower average molecular size preparation (900 x103).9 On the contrary, Ghosh et al. 10 have shown that a lower average molecular size NaHA better protected the articular cartilage from damage in a sheep medial meniscectomy model than one with a higher average size. These reports indicate that the molecular size dependent effects of NaHA vary among experimental models and suggest that the effects of NaHA on articular cartilage cannot be explained solely by molecular size. b See review by Scott in this series. In this model, we could not detect cartilage damage but did observe pathological changes in the synovium. These included increases in synovial fluid volumes, as well as proliferation and degeneration of synovial cells. These changes were more significantly suppressed in the group treated with HA84 than that treated with HA230. 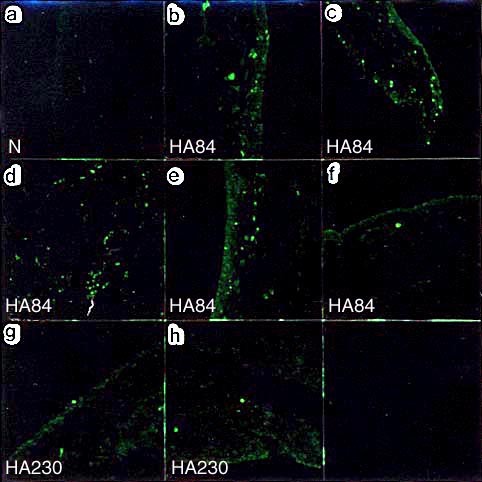 The accessibility of NaHA to the synovial cells was determined by injecting fluorescein-labeled HA84 or HA230 at the last administration. 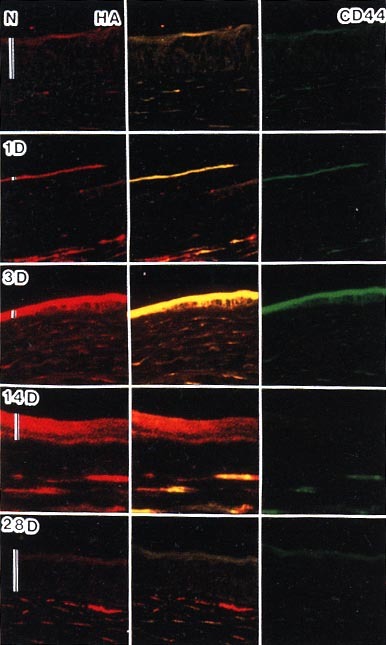 In most cases of the HA84-treated group (five of six cases), fluorescein was prominently distributed in the synovial lining layers (Fig. 2). Conversely, in only two of six cases in the HA230-treated group did there appear a sparse distribution of fluorescein in the same location (Fig. 2). Fig. 2　Distribution of fluorescein-labeled hyaluronan in synovial tissue sections. No fluorescein was detected in the normal contral group (a). Fluorescein was scattered throughout the synovial tissues in five of six cases in the HA84-treated group (b-f). In the HA230-treated group, fluorescein was less prominent and was positive in only two of six cases (g, h). HA230 may not immediately permeate the synovial lining layers because of strong entanglement of the molecules11 of HA230 as well as the larger molecular size of HA230 (Fig. 3). HA84 can gain access to the synovial cells more effectively than HA230. Fig. 3　Hypothesis: for dispersion of two NaHA preparations (HA84 and HA230) in the synovial tissue. a,b. HA230. HA230 cannot easily penetrate into the intercellular spaces in synovial tissue because of its strong entanglement as well as large molecular size, even though it reaches the synovial surface (a). After dispersion, a small amount of HA230 permeates into the intercellular space because it becomes flexible (b). c. HA84. HA84 permeates into the intercellular space of the synovial tissue more easily than HA230 because of its smaller molecular size. The concentration of HA84 in the synovial tissue is therefore higher than that of HA230. It has been shown in studies of patients with osteoarthritis and rheumatoid arthritis that prostaglandin E2 (PGE2) production is up-regulated, and proliferation of synovial cells occurs in the synovium. Several studies in vitro have demonstrated that NaHA suppresses PGE2 production and proliferation of synovial cells in a molecular size-dependent manner, the larger sizes being more effective. In contrast we have shown that HA84 suppresses both the increase in PGE2 concentrations in synovial fluids and the proliferation of synovial cells more significantly than HA230 dose, using the canine ACLT model described above.4 Shimizu et al.12 have also shown that HA84, but not NaHA of 3,600 x103 average molecular weight, suppressed proliferation of synovial cells in a rabbit ACLT model. This indicates that the molecular size dependency of the effects of NaHA found in vitro could be reversed in vivo. While NaHA suppresses PGE2 production and proliferation of synovial cells in a molecular size-dependent manner in vitro, NaHA access to synovial cells can be inversely dependent on molecular size in vivo (Fig. 3). Moreover, Yamashita et al.13 showed that NaHA of 900 x103 average molecular weight suppressed bradykinin-induced knee joint pain in rats better than NaHA of 2,300 x103 average molecular weight did. Therefore, the molecular size dependency of the effects of NaHA found in vitro does not necessarily hold true in vivo. Fukuda et al.2 reported that NaHA suppressed both the production of free radicals and the reduction of proteoglycan synthesis induced by IL-1beta in cultured bovine articular chondrocytes. Homandberg et al.14 showed that NaHA of 900x103 average molecular weight suppressed both the reduction of proteoglycan synthesis induced by fibronectin fragments and subsequent cartilage degradation in vivo and in vitro. Some reports describe the effects of NaHA on synovial cells other than those on the suppressive effect on PGE2 production described above. Takeshita et al.15 have found that HA84 suppresses IL-1beta production in cultured synovial cells from rheumatoid arthritic patients. Takahashi et al.16 argued that expression of matrix metalloproteinase-3 (MMP-3) and IL-1beta were suppressed in synovium but not in cartilage tissues of the rabbit ACLT model by treatment with HA84, even though the suppressive effect on the articular cartilage destruction was still observed.16 This suggests that the suppression of the destruction of articular cartilage is due in part to the suppressive effect of NaHA on MMP-3 and IL-1beta expression in synovial tissue. We have developed a hypothesis to explain the effects of NaHA on osteoarthritis based on its ability to reduce PGE2 production in synovial cells. Increased vascular permeability may be down-regulated by the suppressive effect of NaHA on PGE2 production, because vascular permeability is enhanced by PGE2. Then, the influx of plasma into the joint cavity is reduced, resulting in an increase in hyaluronan concentration and in viscoelasticity in the synovial fluid, consequently decreasing the susceptibility of cartilage to mechanical injuries (Fig. 4). Since PGE2 enhances a nociceptive activity, pain relief after the intraarticular administration of NaHA 5 may be due to reduced PGE2 production (Fig. 4). In traumatic arthritis, which is mimicked by the ACLT model, we found a vicious cycle that consists of activation of synovial cells, hyperproduction of hyaluronan, increase in vascular permeability, hydrarthrosis by influx of plasma, reduction of hyaluronan concentration, i.e., of viscoelasticity in synovial fluids, and consequent to the cartilage damage.17 Therefore, when the pathological changes in synovial tissues are improved by interfering with this vicious cycle, cartilage damage may also be suppressed. Fig. 4　Proposed mechanism of effects of NaHA on osteoarthritis based on the reduction of PGE2 production in synovial cells. In the canine ACLT model described above, HA84 suppressed the degeneration of synovial cells.4 Therefore, we further examined immunoreactivity for heat shock protein 72 (Hsp72), which is essential for the ability of cells to survive environmental insults. 4 We believe that HA84 suppressed vacuolar degeneration, which is likely caused by the mechanical stress resulting from the ACLT, by up-regulating Hsp72 expression in synovial cells. The Hsp72 expression was also more intense in the HA84 than the HA230-treated groups. We are now investigating in detail the effects of NaHA on Hsp expression. Effects of most NaHA preparations have been explained based on their viscoelasticity. However, the effects of NaHA on the synovial tissues and fluids described above are due to their tissues and fluids physiological functions. Many researchers are interested in signal transduction via the hyaluronate receptors CD44c and RHAMM.d Several studies have revealed that hyaluronan has important roles in a living body through its cell physiological functions as well as its physical properties. It will be generally recognized in the near future that NaHA preparations are drugs as well as medical devices. c See reviews by Toole and by Knudson and Knudson in this series. d See review by Turley in this series. The application of hyaluronan in ophthalmology can be cited as another typical medical application. Although hyaluronan has been widely used clinically as a therapeutic agent indicated for osteoarthritis in Japan, it also has been used as an ophthalmic substance worldwide (Table 1). Cataract formation is a disease leading to a loss of transparency of the lens of the eye, and it ranks first as the cause of blindness. Since there has been no satisfactory drug for treatment, surgical removal of the lens is indicated. After the opacified lens is removed, an intraocular lens having a similar lens power is inserted to avoid development of a severe hyperopia. In this surgery, the potential for injury of fragile intraocular tissues, especially those of the endothelial layer of the cornea, is a critical concern. The cornea consists of five layers: epithelium, Bowmans membrane, stroma of the cornea, Descemets membrane, and the endothelium. The endothelium, the innermost tissue, is a monolayer, and its proliferative ability is extremely low. In an area where endothelial cells are removed, peripheral endothelial cells grow to repair it. If damage to the endothelium exceeds its already poor repairing ability, fluid permeates through injured areas and causes corneal edema. Balazs18 proposed a method using viscoelastic materials, such as NaHA, to avoid this problem in cataract surgery. The method using viscoelastic materials at surgery, called viscosurgery, is based on a general idea to solve problems during not only cataract surgery but also other surgical operations. In the case of cataract surgery, viscoelastic materials are used to maintain operative space (depth of the anterior chamber) and to protect the endothelial layer of the cornea or other tissues from physical damage. An example of this method is presented schematically in Figure 5. Pharmacia & Upjohn Ltd. developed the worlds first commercial NaHA product, Healon, for use in ophthalmic surgery. The development of Healon enabled safe implementation of difficult cataract surgery and greatly reduced injury to the endothelial layer of the cornea. Fig. 5　An example of the application of NaHA in the surgery of intraocular lens insertion. After the opacified lens is removed, an intraocular lens is inserted while the depth of the anterior chamber is sufficiently maintained by injecting NaHA. Injury to the corneal endothelium is greatly reduced by this strategy. To maintain operative space (depth of the anterior chamber) and protect the endothelial layer of the cornea, NaHA must have a high viscoelasticity 20. However, in the cataract surgery, the property required for viscoelastic materials has been changed by the introduction of a new technique called phacoemulsification and aspiration (PEA). The lens is wrapped in a lens capsule, which is a thin, transparent membrane. The main component of the lens capsule is type IV collagen. During PEA, the nucleus of the opacified lens is emulsified by ultrasonic waves, followed by aspiration and removal using an irrigative solution after the anterior side of the lens capsule (anterior capsule) is excised. In total enucleation of the opacified lens, an incision wide enough to let the lens pass through is required. PEA has the advantage of requiring a much smaller incision (approximately 3 mm) which allows the passage of devices for ultrasonic waves, irrigation, and aspiration. Cooperation of hyaluronan with its CD44 cell surface receptor is known to be closely associated with cell migration, proliferation and differentiation, i.e., morphogenesis.e We examined the expression of hyaluronan and CD44 in a rabbit corneal epithelial wound healing model after N-heptanol damage, in which morphogenesis is observed.23 The hyaluronan concentration in the cornea gradually increased until day 14 after wounding, and then decreased, returning to the normal level by 56 days after wounding. Keratan sulfate, another glycosaminoglycan, is absent from opaque corneal wounds and reappears during restoration of transparency. The transparency in normal corneal tissues depends on the presence of keratan sulfate rather than hyaluronan. In fact, it is reported that corneal opacities develop in patients with an inherited human corneal dystrophy whose keratan sulfate proteoglycan core protein synthesis is normal, but who have keratan sulfate chains that are defective.24 Within 10 to 20 years these opacities become extensive enough to produce blindness. Keratan sulfate may not be beneficial in the wound healing process under such conditions. e See review by Toole in this series. Using histochemical and immunohistochemical techniques, we analyzed localization of CD44 and hyaluronan in the corneal tissues (Fig. 6). Hyaluronan staining correlated synchronously with staining for hyaluronan in corneal tissues indicated by the biochemical method. Both hyaluronan and CD44 were detected in the corneal epithelium and stroma. During the process of epithelial wound healing, a single layer of the epithelium first extended to the damaged area 3 days after wounding. When the epithelial layer completely covered the wounded area, hyaluronan staining was enhanced in both the epithelial layer and the underlying stroma. The enhanced staining of hyaluronan in the epithelium gradually decreased until it reached normal thickness. Immunoreactivity for CD44 changed concomitantly with that for hyaluronan during early stages until day 3 after wounding. Immunoreactivity for CD44 was weak in the epithelium 14 days after wounding, even though hyaluronan staining was still strong. This suggested that hyaluronan in the extracellular matrix was not anchored to CD44 on the cell surface, and the reduction of CD44 expression may have initiated the decrease in hyaluronan in the epithelium. Hyaluronan expression returned to the normal level by day 28. The data indicated that hyaluronan and CD44 synergistically play important roles in corneal epithelial wound healing. Miyauchi et al.25 have shown that the topical administration of NaHA accelerates the corneal wound healing of rabbit by enhancing the growth of the corneal epithelial cells. According to the report of Miyazaki et al.,26 NaHA enhanced the growth of the corneal epithelial cells. It is hoped that NaHA can be developed as a preparation for corneal wound healing in the future. Histochemical staining of hyaluronan (Texas red) (left column), double staining of CD44 and hyaluronan (central column), and immunostaining of CD44 (FITC) (right column) in rabbit cornea. Co-localization of hyaluronan and CD44 is indicated by yellow staining (central column). N: Normal cornea; 1, 3, 14 and 28 days: corneas 1, 3, 14 and 28 days after wounding, respectively; Bars: thickness of epithelium. Since West et al. 27,28 reported that low molecular weight hyaluronan (1.6 x103-10x103) stimulated angiogenesis, several studies have confirmed this observation (Table 2 [refs. 28-36]). Deed et al. 34 have shown that transcription factors, including c-fos, are implicated in the angiogenesis induced by low-molecular-weight hyaluronan. However, the mechanism of its angiogenic activity has not been completely elucidated. Lokeshwar et al.35 have demonstrated that a high concentration of low molecular weight hyaluronan can be detected in bladder tissues and urine from bladder cancer patients and that the urine of patients with high-grade bladder cancer contained both high-molecular-weight hyaluronan (2,000 x103) and small angiogenic hyaluronan fragments (10 x103). It may be that in high-grade tumor tissues, high-molecular-weight hyaluronan is implicated in metastasis and low-molecular-weight hyaluronan in stimulating angiogenesis to supply blood to tumor tissues. *Hyaluronan of molecular weight of 10x103 showed no effect. **Hyaluronan of moleular weight of 16x103 showed no effect. Among the reports listed in Table 3 [refs. 37-45], Noble et al. 42 have shown that low- molecular-weight hyaluronan (500 x103) but not high-molecular-weight hyaluronan (6,000 x103) induces many kinds of inflammatory factors. Because CD44, a hyaluronan receptor, was found in lymphocytes in 1988, it has been investigated primarily in the area of immunology rather than of research on hyaluronan or glycosaminoglycans. It has been reported that anti-CD44 antibodies stimulate cytokine production in lymphocytes. This finding may have drawn attention to the activities of low-molecular-weight hyaluronan that induce inflammatory factors. It has been reported that low-molecular-weight hyaluronan induces cytokines, chemokines and nitric oxide in macrophages, and several transcription factors, including NF-kappa B, are implicated in this activity (Table 3). Activation of NF-kB is required. According to reports showing the activity of low-molecular-weight hyaluronan as described above (Tables 2 and 3), the molecular sizes of hyaluronan implicated in the induction of inflammatory factors differ from those of angiogenesis. Both activities induced by low- molecular-weight hyaluronan were dependent on CD44 binding, because anti-CD44 antibodies, which block hyaluronan binding, suppressed the activities. These activities of low- molecular-weight hyaluronan are contrary to those of high-molecular-weight hyaluronan, which suppresses angiogenesis 46 and IL-1beta14-16 and PGE24,7 production. These findings suggest that signal transduction via CD44 varier according to the molecular sizes of hyaluronan. As far as we know, there is no receptor-ligand system other than CD44-hyaluronan whose direction of signal transduction changes depending on the molecular size of the ligand. If hyaluronan receptors can move in cell membranes, the larger the size of the hyaluronan, the more it can assemble hyaluronan receptors. In addition, if signal transduction via hyaluronan receptors is dependent on their assembly, i.e., clustering, the signal transduction may change depending on the molecular size of hyaluronan. Further studies are required to elucidate this hypothesis. It seems likely that the simple repeating structure of hyaluronan holds the key. We have discussed medical applications of hyaluronan in osteoarthritis and ophthalmology in the present article. However, further studies are required to explain the mechanisms of action of hyaluronan, even though NaHA preparations have been used for medical purposes for a long time. Unknown functions remain redundant to be revealed. The most prominent topics we should note in recent hyaluronan research are molecular cloning of hyaluronan synthases (HASs) and preparation of HAS knockout mice.f It is expected that the physiological functions of hyaluronan and the role of hyaluronan in diseases will be rapidly elucidated through the investigations of HAS knockout mice and HAS transgenic mice. Thus, genetic engineering can now lead hyaluronan research in new directions. In the coming generation, applications of hyaluronan may well be based on newly found functions of hyaluronan. f See review by Spicer in this series. 1. Balazs EA, Denlinger JL. Clinical uses of hyaluronan. Ciba Foundation Symposium 143:265-275, 1989. 2. Fukuda K, Dan H, Takayama M, Kumano F, Saitoh M, Tanaka S. Hyaluronic acid increases proteoglycan synthesis in bovine articular cartilage in the presence of interleukin-1. J Pharmacol Exp Ther 277:1672-1675, 1996. 3. Sakamoto T, Mizuno S, Maki T, Suzuki T, Yamaguchi T, Iwata H. Studies on the affinity of hyaluronic acid to the surface of articular cartilage and the suppression of proteoglycan release from matrix. Japanese Orthopedic Research Science 11:264, 1984. 4. Asari A, Miyauchi S, Matsuzaka S, Ito T, Kominami E, Uchiyama Y. Molecular weight-dependent effects of hyaluronate on the arthritic synovium. Arch. Histol Cytol 61:125-135, 1998. 5. Gotoh S, Onaya J, Abe M, Miyazaki K, Hamai A, Horie K, Tokuyasu K. Effects of the molecular weight of hyaluronic acid and its action mechanisms on experimental joint pain in rats. Ann Rheum Dis 52:817-822, 1993. 6. Iwata H. Pharmacologic and clinical aspects of intraarticular injection of hyaluronate. Clin Orthop 289:285-291, 1993. 7. Asari A, Mizuno S, Tanaka I, Sunose A, Kuriyama S, Miyazaki K, Namiki O. Suppression of hyaluronan and prostaglandin E2 production in traumatic arthritic synovial cells by NaHA. Connective Tissue 29:1-5, 1997. 8. Dahl LB, Dahl IM, Engstrom-Laurent A, Granath K. Concentration and molecular weight of sodium hyaluronate in synovial fluid from patients with rheumatoid arthritis and other arthropathies. Ann Rheum Dis 44:817-822, 1985. 9. Kikuchi T, Yamada H and Shinmei M: Effect of high molecular weight hyaluronan on cartilage degeneration in arabbit model of osteoarthritis. Osteoarthritis Cartilage. 4: 99-110,1996. 10. Ghosh P, Read R, Armstrong S, Wilson D, Marshall R, McNair P. The effects of intraarticular administration of hyaluronan in a model of early osteoarthritis in sheep. I. Gait analysis and radiological and morphological studies. Semin Arthritis Rheum l22(6 Suppl 1):18-30, 1993. 11. Yanaki T and Yamaguchi T: Temporary network formation of hyaluronate under a physiological condition. 1. Molecular-weight dependence. Biopolymers 30: 415-425, 1990. 12. Shimizu C, Kubo T, Hirasawa Y, Coutts RD, Amiel D. Histomorphometric and biochemical effect of various hyaluronans on early osteoarthritis. J Rheumatol 25:1813-1819, 1998. 13. Yamashita I, Atsuta Y, Shimazaki S, Miyatsu M. Effects of prostaglandin E2 and sodium hyaluronate on bradykinin induced knee joint pain in rat. Japanese Nippon Seikeigeka Gakkai Zasshi-J Jpn Ortho Assoc 69:735-743, 1995. 14. Homandberg GA, Hui F, Wen C, Kuettner KE, Williams JM. Hyaluronic acid suppresses fibronectin fragment mediated cartilage chondrolysis. I. In vitro. Osteoarthritis Cartilage 5:309-319, 1997. 15. Takeshita S, Mizuno S, Kukuchi T ,Yamada H, Namiki O, Horie K. The IN VITRO effect of hyaluronic acid on IL-1production in cultured rheumatoid synovial cells. Biomedical Research 18:187-194, 1997. 16. Takahashi K, Goomer RS, Harwood F, Kubo T, Hirasawa Y, Amiel D. The effects of hyaluronan on matrix metalloproteinase-3 (MMP-3), interleukin-1beta (IL-1beta), and tissue inhibitor of metalloproteinase-1 (TIMP-1) gene expression during the development of osteoarthritis. Osteoarthritis Cartilage 7:182-190, 1999. 17. Asari A, Miyauchi S, Sekiguchi T, Machida A, Kuriyama S, Miyazaki K, Namiki O. Hyaluronan, cartilage destruction and hydrarthrosis in traumatic arthritis. Osteoarthritis Cartilage 2:79-89, 1994. 18. Balazs EA. Sodium hyaluronate and viscosurgery. In: Miller D, Stegmann R, eds. Healon (sodium hyaluronate). A guide to its use in ophthalmic surgery. New York: Wiley, 1983:5-28. 19. Liesegang TJ. Viscoelastic substances in ophthalmology. Surv Ophthalmol 34:268-293, 1990. 20. Miyauchi S, Iwata S. Evaluations on the usefulness of viscous agents in anterior segment surgery. I. The ability to maintain the deepness of the anterior chamber. J Ocul Pharmacol 2:267-274,1986. 21. Miyauchi S, Horie K, Morita M, Nagahara M, Shimizu K. Protective efficacy of sodium hyaluronate on the corneal endothelium against the damage induced by sonication. J Ocul Pharmacol Ther 12:27-34, 1996. 22. Arshinoff SA. Dispersive and cohesive viscoelastic materials in phacoemulsification. Ophthalmic Practice 13:98-104, 1995. 23. Asari A, Morita M, Sekiguchi T, Okamura K, Horie K, Miyauchi S. Hyaluronan, CD44 and fibronectin in rabbit corneal epithelial wound healing. Jpn J Ophthalmol 40:18-25, 1996. 24. Hassel JR, SundarRaj N, Cintron C, Midura R and Hascall VC. Alteration in the synthesis of keratan sulfate proteoglycan in corneal wound healing and in macular corneal dystrophy. In: Greiling H and Scott JE (eds) Keratan sulfate. 215-225, 1988. 25. Miyauchi S, Sugiyama T, Machida A, Sekiguchi T, Miyazaki K, Tokuyasu K, Nakazawa K. The effect of sodium hyaluronate on the migration of rabbit corneal epithelium. I. An in vitro study. J Ocul Pharmacol 6:91-99, 1990. 26. Miyazaki T, Miyauchi S, Nakamura T, Takeshita S, Horie K. The effect of sodium hyaluronate on the growth of rabbit corneal epithelial cells in vitro. J Ocul Pharmacol 12:409-415, 1996. 27. West DC, Shaw DM. Tumour hyaluronan in relation to angiogenesis and metastasis. In: Laurent TC, ed. The chemistry, biology and medical applications of hyaluronan and its derivatives. 1998:227. 28. West DC, Hampson IN, Arnold F, Kumar S. Angiogenesis induced by degradation products of hyaluronic acid. Science 228:1324-1326, 1985. 29. West DC, Kumar S. The effect of hyaluronate and its oligosaccharides on endothelial cell proliferation and monolayer integrity. Exp Cell Res 183:179-196, 1989. 30. Rooney P, Wang M, Kumar P, Kumar S. Angiogenic oligosaccharides of hyaluronan enhance the production of collagens by endothelial cells. J Cell Sci 105(Pt 1):213-218, 1993. 31. Sattar A, Rooney P, Kumar S, Pye D, West DC, Scott I, Ledger P. Application of angiogenic oligosaccharides of hyaluronan increases blood vessel numbers in rat skin. J Invest Dermatol 103:576-579, 1994. 32. Lee VC, Fan TPD, West DC. Angiogenesis in a delayed revascularization model is accelerated by angiogenic oligosaccharides of hyaluronan. Lab Invest 73:259-266, 1995. 33. Montesano R, Kumar S, Orci L, Pepper MS. Synergistic effect of hyaluronan oligosaccharides and vascular endothelial growth factor on angiogenesis in vitro. Lab Invest 75:249-262, 1996. 34. Deed R, Rooney P, Kumar P, Norton JD, Smith J, Fremont AJ, Kumar S. Early-response gene signaling is induced by angiogenic oligosaccharides of hyaluronan in endothelial cells. Inhibition by non-angiogenic, high-molecular-weight hyaluronan. Int J Cancer 71:251-256, 1997. 35. Lokeshwar VB, ⑸ek C, Soloway MS, Block NL. Tumor-associated hyaluronic acid: A new sensitive and specific urine marker for bladder cancer. Cancer Res 57:773-777, 1997. 36. Rahmanian M, Pertoft H, Kanda S, Christofferson R, Claesson-Welsh L, Heldin P. Hyaluronan oligosaccharides induce tube formation of a brain endothelial cell line in vitro. Exp Cell Res 237:223-230, 1997. 37. Noble PW, Lake FR, Henson PM, Riches DW. Hyaluronate activation of CD44 induces insulin-like growth factor-1 expression by a tumor necrosis factor-alpha-dependent mechanism in murine macrophages. J Clin Invest 91:2368-2377, 1993. 38. Noble PW, McKee CM, Cowman M, Shin HS. Hyaluronan fragments activate an NF-kappaB/I-kappaB alpha autoregulatory loop in murine macrophages. J Exp Med 183:2373-2378, 1996. 39. Hodge-Dufour J, Noble PW, Horton MR, Bao C, Wysoka M, Burdick MD, Strieter RM, Trinchieri G, Pure E. Induction of IL-12 and chemokines by hyaluronan requires adhesion-dependent priming of resident but not elicited macrophages. J Immunol 159:2492-2500, 1997. 40. McKee CM, Lowenstein CJ, Horton MR, Wu J, Bao C, Chin BY, Choi AM, Noble PW. Hyaluronan fragments induce nitric-oxide synthase in murine macrophages through a nuclear factor kappa B-dependent mechanism. J Biol Chem 272:8013-8018, 1997. 41. el Maradny E, Kanayama N, Kobayashi H, Khatun S, Liping S, Kobayashi T, Terao T. The role of hyaluronic acid as a mediator and regulator of cervical ripening. Hum Reprod 12:1080-1083, 1997. 42. Noble PW, McKee CM, Horton MR. Induction of inflammatory gene expression by low-molecular-weight hyaluronan fragments in macrophages. In: Laurent TC, ed. The chemistry, biology and medical applications of hyaluronan and its derivatives. 1998: 219-225. 43. Horton MR, Burdick MD, Strieter RM, Bao C, Noble PW. Regulation of hyaluronan-induced chemokine-gene expression by IL-10 and INF-gamma in mouse macrophages. J Immunol 160:3023-3030, 1998. 44. Rockey DC, Chung JJ, McKee CM, Noble PW. Stimulation of inducible nitric oxide synthase in rat liver by hyaluronan fragments. Hepatology 27:86-92,1998. 45. Oertli B, Beck-Schimmer B, Fan X, Wuthrich RP. Mechanisms of hyaluronan-induced up-regulation of ICAM-1 and VCAM-1 expression by murine kidney tubular epithelial cells: hyaluronan triggers cell adhesion molecule expression through a mechanism involving activation of nuclear factor-kappa B and activating protein-1. J Immunol 161:3431-3437, 1998. 46. Feinberg RN, Beebe DC. Hyaluronate in vasculogenesis. Science 220:1177-1179, 1983.